From enduring hope in dark times to the exuberant enjoyment of living, a new season of concerts from St Albans Symphony Orchestra (SASO) celebrates the power of music to portray and enhance contrasting aspects of human experience. The grim realities of life in Stalin’s Russia are prominent in the opening concert on Saturday 13 October featuring Shostakovich’s dramatic Symphony No 5, written at a time when the composer’s career and very survival were threatened by political tyranny. His Cello Concerto No 1 will be played by internationally acclaimed soloist Matthew Sharp, and the programme open with Malcolm Arnold’s Peterloo Overture, depicting the slaughter by cavalrymen of unarmed protesters in Manchester 200 years ago. In quite different style, SASO’s traditional concert in St Albans Cathedral to celebrate New Year’s Day mixes excerpts from classic dance scores by Prokofiev (Romeo and Juliet) and Massenet (Le Cid) with music from the movies, including The Bridge on the River Kwai, Raiders of the Lost Ark and The Good, the Bad and the Ugly. Favourite Viennese music by Johann Strauss the Younger also make an appearance under both main headings. The orchestra’s Saturday March 9 concert features the ever-popular Violin Concerto by Brahms, played by soloist Clare Howick whose recordings and appearances in concert halls and on BBC Radio 3 have gained critical praise. The programme also includes Storr, a ‘symphonic poem’ by contemporary British composer Matthew Taylor and the inspiring Symphony No 9 by Schubert, otherwise known as ‘The Great C-Major’. 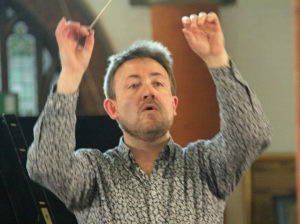 SASO’s 2018-19 evening concerts will be conducted by their Principal Conductor, Tom Hammond (pictured above), with the exception of Saturday 11 May, when guest conductor William Carslake will take the helm for a programme of English music. This will feature the noble and passionate Symphony No 1 by Elgar, as well as The Wasps Overture and Tallis Fantasia by Vaughan Williams. More immediately, families with youngsters at primary school can look forward to musical fun and games on the high seas at Pirates Aarrh-Hoy!, the orchestra’s two children’s concerts on the afternoon of Sunday 18 November, with guest conductor Matthew Andrews. A salty selection of classics will be animated by Annette Holland and David Bevan of Best Theatre Arts. * With the exception of New Year’s Day, all SASO concerts in 2018-19 take place in St Saviour’s Church, Sandpit Lane, AL1 4DF.